The Nikon D3s Digital SLR Camera features a 3” LCD screen, 170º viewing angle, 100% frame coverage, and an EXPEED image processor inside a strong-yet-lightweight magnesium alloy body with a professional form factor. The high pixel count, FX (full) format sensor produces exceptionally sharp, clean and well-saturated images. An electronic virtual horizon is available during Live View shooting for perfectly straight shooting and dual CF card slots allow you to record the same data on both cards for backup. Set the D3s in DX mode and get extra reach from your lens as well as a shooting boost (up to 11 FPS). The factory-installed buffer memory is twice the capacity of the D3, which dramatically increases the power of continuous shooting. This camera is ideal for high-speed shooting of events, sports, and nature. Please note that there is limited video capability with this camera. If you want a similar camera that can shoot higher quality video, please see the Nikon D4, Nikon D4s, or the Nikon D5. 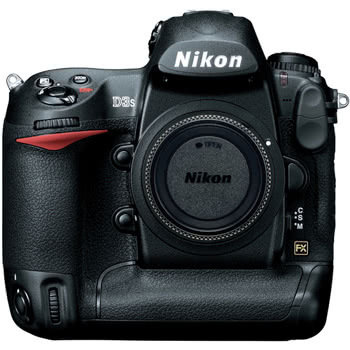 • This Nikon D3s accepts dual CF cards which are not included with this rental and are rentable separately. • There is limited video capability with this camera. If you want a similar camera that can shoot higher quality video, please see the Nikon D4, Nikon D4s, or the Nikon D5.